From all the signs hanging on the outside of buildings, this must be the time to sell in San Telmo. (I count 9 for sale signs in this photo). I just wish that someone would go ahead and buy all those buildings so that they can take down those for sale signs and return the streets to normal. All the signs are messing up everyone’s photos of these lovely streets. Actually, there’s a building down the street from me on Av Caseros that was sold over six months ago and the “for sale/sold” signs are STILL hanging all over that building. Enough! 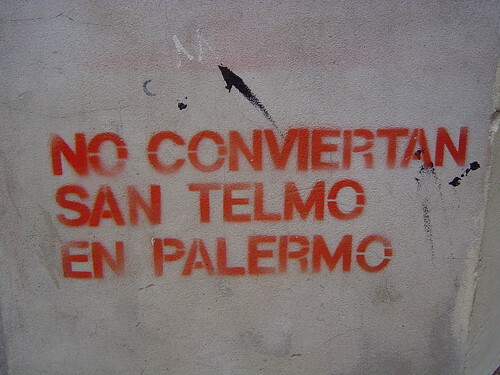 Walking somewhere along Chile I came across this new stencil, imploring that San Telmo not become Palermo. But I think that it’s a lost cause. At least San Telmo has more interesting architecture than Palermo. Relocating and Living in Argentina is a good source of information for those considering the move Buenos Aires. 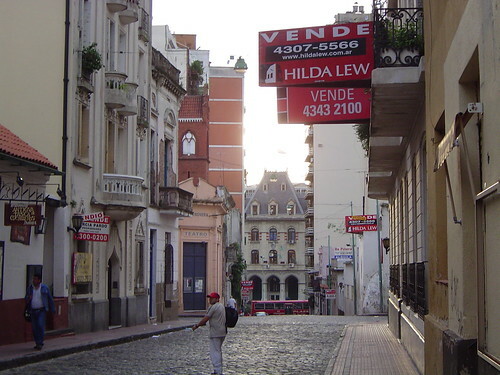 There’s a really good blog about a newcomer’s experiences in Argentina over at Expat Argentina. I’ve added it to my Bloglines.